Again we’re faced with spot removal from our new carpet, one of those unexpected accidents of life! As aggravating as these accidents can be at times they are often easier to overcome than we would expect. This is especially true when it comes to spot removal of those dirty spots and spills on our carpet. Sure it is upsetting to install a new wall to wall carpet only to have your child or husband track in mud or spill a beverage. Now you are faced with spot removal to remove those spots that you should not have had in your newly carpeted room in the first place. The good news is that those disturbing spots from mud to milk or even blood are usually easier to clean from the carpet than you think. With only a small amount of effort at spot removal, even stubborn spots and spills can usually be removed. 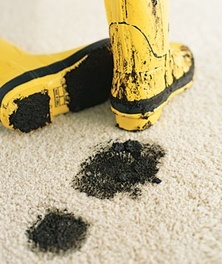 Here are several spot removal tips that will help you keep your carpet looking great. Spot removal products are available at the local hardware store, supermarket, big box store, department store or carpet store, the only problem is deciding which product you need for every type of conceivable spot that you may experience in the future. When looking for a product always read the labels thoroughly. Even with a thorough reading you may still find the information on the packaging vague and the stores salesperson only knows what they have heard others, information that is often wrong. To help you prepare for those carpet spill accidents here are a few tips on both spot removal procedures and also the products you should keep on hand. Stains and spots are a carpet’s worst enemy, which is why you should always get them out as soon as you can – to prevent things from getting any worse. A wet area be-it water, beverage, etc needs to be blotted up immediately. If left for an extended period of time, wet areas and the residues from almost any type of spill will pick up soil making it more difficult to clean. Most spots can be removed with a water-dampened towel. 1. You should only use white rags or towels when you clean carpet and upholstery to reduce the risk of ruining colors or color transfer. 2. You should always test your product of choice first on a hidden area to save yourself heartache and embarrassment in case things don’t turn out the way you hope. 3. For information on removing a new spot or a spot that will not come out, the Carpet and Rug Institutes offers a toll-free information line for assistance. The CRI can be reached at 1-800-882-8846. 4. If you need the help of a professional, you shouldn’t hesitate to contact one. If you have a red dye stain on your carpet such as those left by many beverages, you will probably want to call a professional carpet cleaning company. When you call let them know what the spot is so that they can send out a cleaning professional that is prepared to clean this type of stain. In most situations recurring spots are a maintenance problem and not a carpet problem. Often it is the spot removal cleaning that is causing the problem. A spot removal product is used on the carpet and the spot returns. The spot is again cleaned and returns. The most common cause of this is the spot cleaning residues are not being removed and they are attracting soil. Many detergent residues leave behind sticky residues that attract soil. Test your spot removal and other cleaning products to make sure that they are not leaving behind sticky residues. This evaluation is accomplished my mixing the solution to the recommended dilution ratio. Place an ounce or two of this solution in a petri dish, bowl, dish or another flat, clean, container. Allow the solution to evaporate and examine the residue to determine if it is sticky, waxy or has turned to a hard crystal like or powder consistency. You will want to stay away from products that dry to a waxy, sticky or oily residue. Another common cause of recurring spots is the over use of a product. All too often a person will believe that if a drop does a good job several drops will do a better job. Detergents do not work that way. They are formulated to work efficiently at specified concentrates. While the correctly mixed product would have done a great job the higher concentrate will leave residues to attract soil. An easy way to test fiber for the presence of a fluorochemical is to cut a couple of fibers from a non traffic area and apply a few drops of oil and water mixture. If it beads up, then there is an active fluorochemical present. Whenever testing for the presence of the acid dye blocker, you should again cut a couple of fibers from a non traffic area, then immerse the fibers in a red kool-aid mixture and wait for 5 minutes or so. Remove the fiber from the liquid and flush with neutral detergent solution. If the acid blockers are present and active, there will be no discoloration. While optical brighteners can make a carpet appear cleaner, they have a harmful effect on carpet fibers. Technical people in the carpet industry have unanimously taken a stand against the use of brightening agents in the cleaning process. But, even with all of the adverse publicity, optical brighteners or color brighteners, as they are often called, are still used in some spot cleaning products, shampoo, dry-foam and extraction detergents. Optical brighteners are actually dyes, which reflect the light and eventually cause yellowing in carpet fibers. For this reason alone, every legitimate carpet cleaning company should outlaw their use.